Capitalists@Work: Blacks in the red. Blacks Leisure have avoided administration and destruction by getting landlords and creditors to agree to a company voluntary agreement. Landlords are having a bit of a moan at having to take all the pain but they have little option. Long lease agreements with upwards only rent increase and unfair rent reviews have punished retailers for a long time. A unit may have had a brand new retail park open at the other end of town and still find itself locked into a 12 year lease with increasing rents as its footfall continually drops making it not just unprofitable but completely cancelling the profit from another store or two. Now, with empty space on every high street in the land the hiking boot is on the other foot. Liz Peace, chief executive of the British Property Federation, said: "While this CVA has covered landlords' empty rates payments, it has not taken any bite out of shareholders' or other creditors' pockets. Landlords have borne all the pain, and when you consider that many of our pension funds are invested with them, it is clear this is not fair." Landlords have to pay the rates even on empty buildings and with virtually no chance of an early let for the newly empty Blacks and Millets units the administrators X in the £ wouldn't have gone far. In fact landlords still have a pretty good deal. For one, they are not among the 450 staff who will be unemployed shortly as Blacks Leisure close their 89 worst performing stores, about a 1/4 of the group. Secondly they will get a 6 month rental payment. Thirdly they will continue to have the rates paid on the empty units, which are usually a third of the total rent bill, by Blacks instead of having to pay them themselves.. Fourthly, by being forced to agree to monthly, instead of three monthly in advance rents, they have greatly increased the chances of the firm surviving to honour its future rental payments. Lastly, although there is no detail, it would be amazing if the new lease agreements do not contain entirely favourable conditions for the landlord, such as a one way, one month notice to quit, or rent review in 2010 or something similar. Blacks has been on the C&W sick list a long time. KPMG who brokered this CVA also did so for JJB, another on the very sick list. They are not in the clear, just temporarily out of intensive care, but the new improved medical facilities might just help them survive. Its not guaranteed though. BQ can think of at least two high street chains that currently pay zero rents and are still losing money every day. Fourthly, by being forced to agree to monthly, instead of three monthly in advance rents, they have greatly increased the chances of the firm surviving to honour its future rental payments. They still have to pay them and need to budget for this. It's Ricardo's Law of Rent. Landlords do disproportionately well in The Good Times (for absolutely no risk or effort) and do particularly badly in The Bad Times - so I advise them to cut their rents to ensure their premises remain occupied and stop bloody whining. However they have discounted too far on falling volumes. As people keep reminding us, turnover is not profit. i would have thought that increasing numbers of staycations might have meant some cheer for blacks. 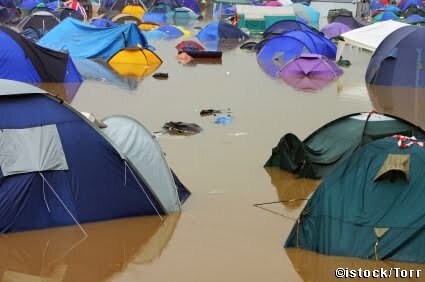 though perhaps camping in Britain is still for the brave? "However they have discounted too far on falling volumes." how intriguing! robert dyas? clarks? Excellent post, BQ. I wondered why the local Millets had closed down. I thought it was because there was a Blacks store in the same Mall and the market demand couldn't sustain both stores. The other thing I noticed with Millets was that their online offers differ from their in store offers. With other retailers they are the same and goods (that may not be in stock) can be ordered online and returned to a local store (eg. Hobbs, LTS). Their online offeres are generally better than their instore offers so it's puts you off going to the store. And whilst I may intend to order online I never seem to get around to it, but I would be more inclined if I could have returns to the store rather than using a courier and having to wait in half the day. Listening to customers now would be good. But there are places like BHS who do coats cheaper and dedicated sports stores like Decathlon who sell goods much much cheaper. In todays financial climate I'm afraid brand preferance disolves.